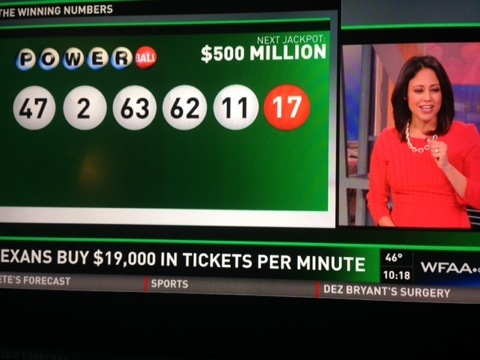 TEGNA8 posted wrong winning Powerball numbers at 10:06 p.m. Given all the attendant publicity, it became incumbent to report the correct winning combination Wednesday night in a Powerball sweepstakes of $524 million and counting. But Dallas-based TEGNA8 couldn’t get its numbers straight. 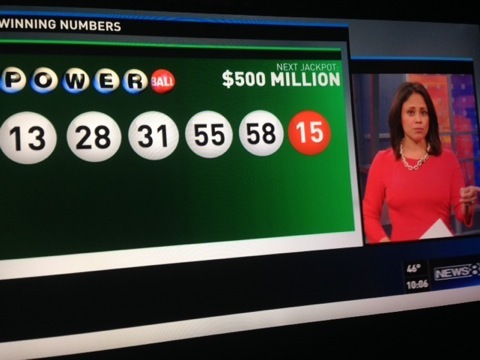 As shown above, the station posted a completely wrong set of six winning digits at 10:06 p.m. on its late night newscast. Twelve minutes went by before the ABC affiliate finally wised up and put the correct numbers on-screen. There likely wasn’t much to love from anyone who thought they had won a sizable amount of money after TEGNA8 misled them. Several hundreds or thousands of dollars in winnings isn’t peanuts, after all. But never mind. The correct numbers eventually turned those winners into losers. Conversely, some who thought they were losers might have torn their tickets up before TEGNA8 corrected itself. “I blame it on the graphics system,” Izaguirre reiterated on the air. Izaguirre was blameless in all of this as the reluctant and embarrassed messenger. But if the graphics system indeed failed to ”update” the numbers, it’s still a mystery where they came from. Dating back to Oct. 31st of last year, there has been no winning Powerball combination of 13 28 31 55 58 and 15. TEGNA8 news director Carolyn Mungo has not returned an email message asking for an explanation. To use a money metaphor, the station tends to lock down like Fort Knox whenever “internal matters” or employee dismissals are involved. Izaguirre’s Steve Harvey reference was tied to the comedian’s massively publicized announcement of the wrong winner as host of the Dec. 20th Miss Universe pageant on Fox. “I’m gonna go disappear now,” Izaguirre said at the end of the sportscast. But she was back to close out the show. “It was a fun one, wasn’t it?” Izaguirre said. TEGNA8 didn’t bother to re-edit the 10 p.m. newscast for the nightly 12:35 a.m. rebroadcast. The same Powerball mistake and belated correction were repeated in their entirety. There were no Jackpot winners in Wednesday night’s drawing. The next one will be on Saturday, Jan. 9th, with a current grand prize of $675 million, according to the official website powerball.com.